In the year 2000 Koei released Shin Sangokumusō, or as it is known in the States, Dynasty Warriors 2. Since that time Koei has become known for their Warriors games, having published approximately 900 games using that one vs several thousand formula between sequels, expansions, and crossover titles. In 2014 they were able work out some deal to combine that formula with the widely beloved The Legend of Zelda franchise. 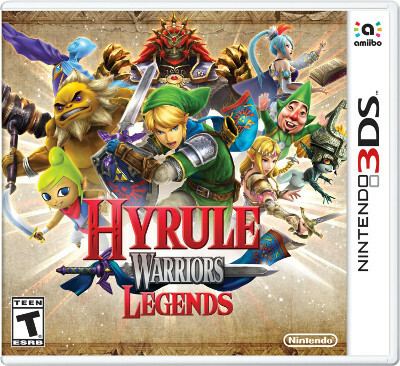 Hyrule Warriors Legends is an expanded version of Hyrule Warriors, now available in convenient travel size. Just like its counterpart on the Wii-U, this is not a Zelda game in the traditional sense. Between the two franchises, this plays much more like a Dynasty Warriors (or Samurai, or Orochi, or well, you get the idea) game than a Zelda game. That being said, it is a hybrid of the two styles, maybe 2/3 Warriors and 1/3 Zelda. Standard Zelda subweapons, such as boomerang and bombs, and part of the arsenal and can be swapped with the arrow keys. Familiar boss monsters such as Gohma and Dodongo are included, along with the traditional means of disposing of them. There is a lot of Zelda fan service in this game taken from the assorted games, but at the end of the day the focus is on taking on thousands of enemies in one battlefield instead of dungeon exploration. To make the portable version of the game seem fresh a year and half later a few extra bonuses were included in this incarnation. Among them is the introduction of the character Linkle, who was created as a response to the question “what if Zelda was a girl?” Linkle is actually her own character with her own unique set of fighting moves and equipment. 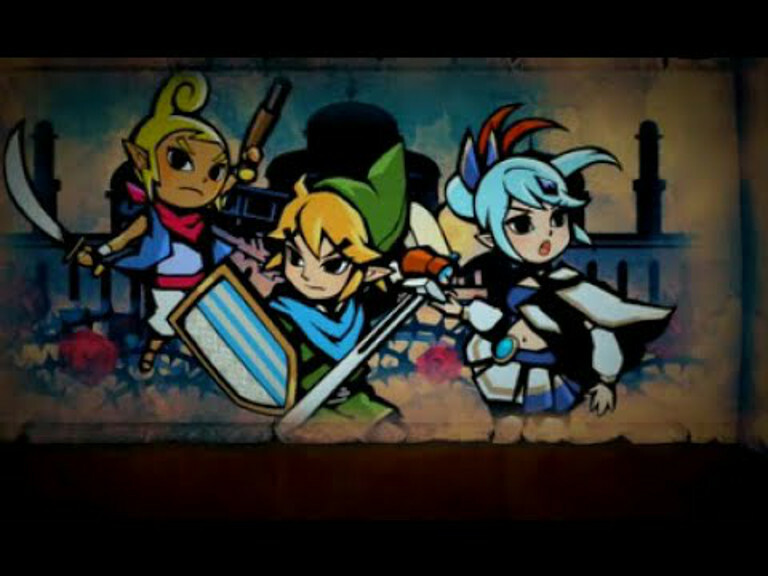 My early speculation was she would be nothing more thank Link with pigtails added and thankfully I was wrong. She has her own backstory, and instead of the predictable sword and shield approach she dual wields crossbows. Whether or not such a weapon choice is practical, it looks cool and she is fun to play. 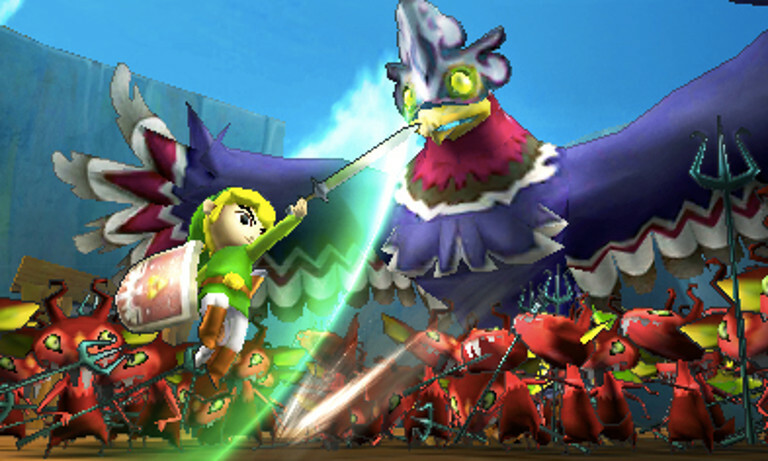 The Wind Waker was conspicuously absent from the initial release, but additions to the 3DS version such as Toon Link and some stages based on The Wind Waker remedy that deficiency. A notable improvement to this version is the ability to switch characters in the middle of battle. This is a useful feature when bases are about to fall or just if a new side mission objective appears on the other side of the map of the gigantic, sprawling map. Having to take care of business on the other end of the map is so much more convenient when getting there is simply a matter of tapping a character’s face instead of running across the vast terrain. Being able to change characters on the fly helps with strategy as well. The bottom screen can also be used to direct playable characters to a destination when you are not controlling them. They aren’t exactly the most diligent when they are dispatched. They cannot be depended on to capture a base or kill a boss, but they do seem to a decent job of keeping bases they are from being overthrown. It is also nice just to be able to spread out the team for the reasons mentioned earlier just to be able to travel to different locations quickly. Having the party assembled during a boss battle does give some passive bonuses, so rallying them to your location has its perks. The soundtrack is mostly classic Zelda tunes, unsurprisingly remixed to sound like they would fit in with the battle anthems from Koei’s flagship franchise. The music is good, it fits the game perfectly, but I cannot help but feel there was a missed opportunity in this crossover. There is a particular song that extols the heroism of Link that would have been the perfect accompaniment to slaughtering hordes of moblins and stalfos. Visually the game is obviously downgraded from the Wii-U version but still looks good. The 3D effect helps compensate for the downgrade. The overall experience is not quite as mindless as a typical Warriors game but the exploration and puzzle solving is virtually non existent compared to a standard Zelda title. Each stage has numerous side quests that spring up that have varying degrees of urgency. These can be protecting bases, escorting villagers, or escorting cuccos. That last one is of particular importance. A recurring motif in Zelda games that began with A Link to the Past is angering cuccos is a bad idea, and this game is no exception. If the little chicks are not safely escorted to the mother she can become enraged and hostile toward the player. Or if you encounter a cucco minding its own business and feel like being a sadistic jerk, attacking it can anger it and cause the hordes of angry cucco reinforcements to launch an airborne assault. That is not to say waging war against flying chickens isn’t fun, it can just be counterproductive to say keeping Darunia from getting killed. Treasure boxes appear when certain conditions are met, and the standard Zelda jingle is present when opened. I have never seen anyone so happy to open up a box and find a piece of a heart inside, but perhaps I am being too ethnocentric. Hyrule has its own culture and heritage, so who am I to judge? One of the bigger criticisms of the Warriors games, and it is not without merit, is how repetitive they are. This is true of title as well, but the ever growing party and the getting new subweapons help keep the experience from getting stale. The different boss monsters also require their own approach, which also allows the game to be enjoyed for extended periods of time. Granted this is coming from a reviewer who has probably purchased 600 of the 900 Warriors games released in the past decade and a half. Every dungeon in a Zelda game has a unique quality to it, and this while I would not say each battlefield is truly unique a solid attempt was made to include that quality. An example is in the battle where the boomerang is unlocked, there is a certain obstacle that cannot be bypassed until the boomerang has been acquired. 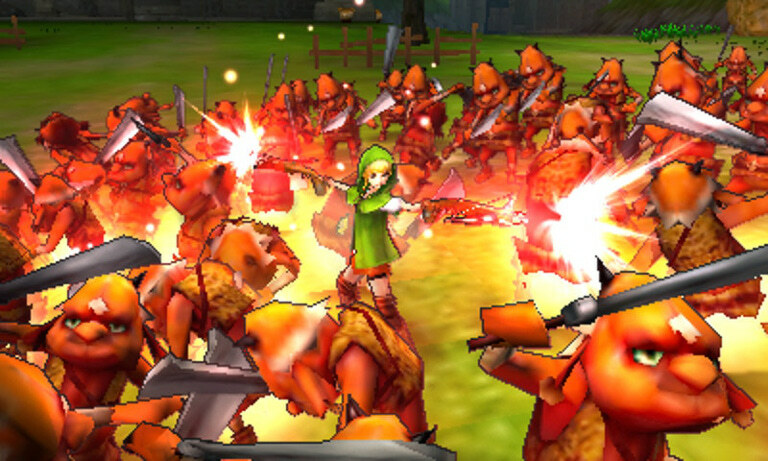 Hyrule Warriors Legends was designed to be a Zelda spin-off and not the next entry in the Zelda series. As far as Warriors games are concerned, this adds enough Zelda elements to it that set it apart from the other games Koei Tecmo has been pumping over the years. Even though it uses a familiar design model and is cast with a cornucopia of characters from one of gaming’s biggest franchises, the end result is a unique experience. People who do not enjoy Warriors games will not be converted, but for those who enjoy it, Hyrule brings enough new ideas to the format that it will feel like a new experience. Graphic quality downgrade aside, the additional content makes the 3DS version overall superior to its Wii U counterpart.